British Beatles Fan Club: EX-BEATLE TO MAKE ACTING DEBUT! EX-BEATLE TO MAKE ACTING DEBUT! Former Beatles drummer, Pete Best, is to play himself in a brand new comedy stage production called, Lennon's Banjo. Written by Rob Fennah, the show is about a quest to find the holy grail of pop memorabilia - the first instrument John Lennon learned to play which has been missing for 60 years and now worth millions to whoever finds it. Set in present day Liverpool, the stage play is based on the novel 'Julia's Banjo' by Rob Fennah and Helen A Jones. Pete said: "I read the novel 'Julia's Banjo' some years ago and thought it was a great mix of fact and fiction with regards to the Beatles and the elusive banjo. It made me smile; a really enjoyable read. So, when speaking to Rob Fennah about the book becoming a stage play, I said in passing, 'I should play me!' And low and behold, here I am doing a few of the performances. I would have loved to have done all of them but prior commitments made that impossible. Anyway, either with me, or the actor playing me, this show is going to be great fun!" Pete Best's confirmed performance dates will be Wednesday 25th April 2.30pm and 7.30pm and Saturday 5th May at 7.30pm. Lennon’s Banjo – one of the most hotly-anticipated new plays of 2018 - will premiere at Liverpool’s Epstein Theatre next spring. Produced by Pulse Records Ltd in association with Bill Elms, Lennon’s Banjo will open at Liverpool’s Epstein Theatre on Tuesday 24 April 2018 for a two-week run, continuing through until Saturday 5 May. 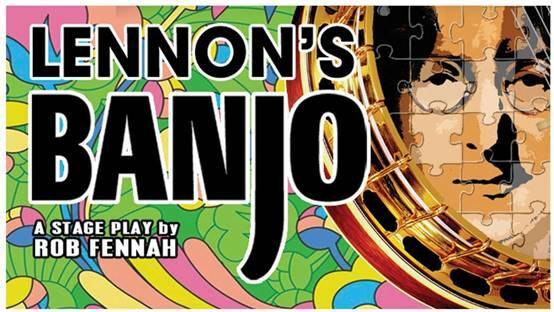 Directed by Mark Heller, Lennon’s Banjo stars Eric Potts, Jake Abraham, Mark Moraghan, Stephanie Dooley, Lynn Francis and Roy Carruthers, with more cast to be announced soon. On 9 October 1957, a young John Lennon turned 17. It was the last birthday he would spend with his mother, Julia, who was killed the following summer in a road traffic accident. 2018 marks the 60th anniversary of Julia's death and the banjo's disappearance. Mysteriously, the banjo went missing shortly after Julia Lennon’s death and no-one has set eyes on it since. One thing is certain though, if it did resurface it is estimated to be worth in the region of five million pounds. So where do the facts end and the fiction begin? Everything will be revealed in this intriguing, colourful and fast-paced comic caper starring a talented cast of actors.